Jackfruit halwa is a simple, drool-worthy and tastes heavenly. I learnt this recipe(stove-top method) from my school friend Sukanya. I slightly modified it for quick microwave version. 1). Deseed the Jackfruit, chop into chunks. Pulse it in a mixer or food processor (Don't add water) and keep aside. 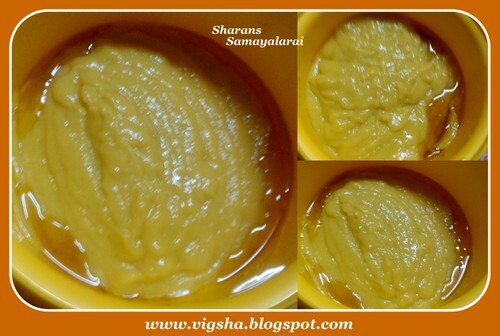 Take medium sized microwave safe bowl, add a tablespoon of ghee and microwave for 2minutes. 2). Add the pulsed pulp and set the microwave high for 10minutes. Add ghee and stir in-between for every 2-3minutes. 3). When the raw smell leaves, add sugar and microwave for 5more minutes. 4). The ghee starts to seperate out from the halwa when it is done. Let it rest in the microwave for 5more minutes. 5). Grease the plate and pour the halwa mixture and smoothen the top surface with a spoon /spatula.When the Jackfruit halwa cools, cut into pieces or serve it assuch. Halwa is ready !! 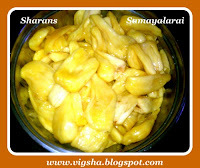 Relish the delicious Jackfruit Halwa. # The more ghee you add, the tastier the halwa will be. # You can very well garnish the halwa with nuts. # Adding cardamom powder is optional. Jackfruit halwa is really new to me. You presented very nicely. Looks delicious. Halwa with Jackfruit is new to me. Looks very interesting and delicious. never tried halwa using oven.. perfectly made..
microwave jackfruit halwa, interesting...very easy n sounds delicious too...well made!! Super tempting and yummy halwa. Thank u for visiting my space . Halwa is so easy and looks delicious, I’m bookmarking the recipe. Following you here, I would appreciate if you visit my site. Unfortunately we dont get fresh jackfruits here, else i would love to make some halwa as urs, inviting. Interesting recipe. Alas, jackfruit is not readily available here. thank you for visiting me. I love your blog and I am very pleased to follow you! thanks for stopping in my space and inviting in ongoing festival. please tell me whether i can cook any kind of dish. Hi saranya,thx u for visiting my space...u have a nice blog,never tried this halwa,looks invitin!! Looks so tasty, unfortunately we don't get jackfruit here!